About a year ago, I wrote a blog post talking about experience points in Frostgrave and some thoughts I had for changing the system. I got a great response to that post, which has helped push my thinking forward. In fact, I have decided that I am going to include an ‘Alternate Experience Points System’ in a Frostgrave supplement that is coming out next year. I just haven’t completely decided what it is going to include! My biggest mental stumbling block continues to be experience points for spellcasting. Right now, a wizard receives 10 experience points for every spell he successfully casts. The more I have thought about this, the more I am convinced that it is both a good and bad piece of game design. It is good in that it encourages spellcasting, which is what the game is primarily about. Also, players are rewarded for ‘accomplishing’ which feels right. It is bad because it encourages a player to cast his or her easiest spell repeatedly, which detracts from the magical diversity of the game and lessens tactical interest. Additionally, as a wizard gets better, that one spell will get easier to cast, making experience points more likely and potentially creating an experience imbalance between players who use just one spell and those who like to use a range of spells. I don’t think this last point is a major issue, but it is an area for improvement. So, here are two potential solutions I came up with in my musings on the problem. Both of them address the bad points of the current system, but also have an issue of their own! Under this system, whenever a wizard successfully casts a spell, he or she would receive a number of experience points equal to the Casting Number for the spell. So, if a starting Necromancer casts Bone Dart (as so many of them do), they would receive 8 experience points, as that would be their starting Casting Number. 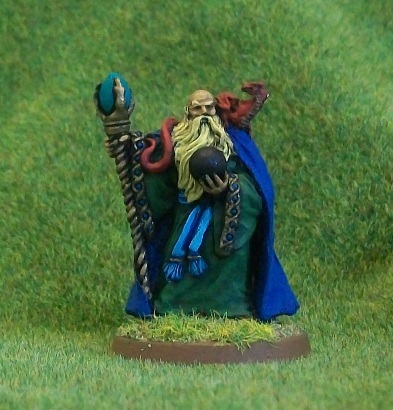 If the Necromancer later decreases his Casting Number to 7, he would receive 7 experience points every time he successfully casts the spell. There is an elegance to this system that I find very appealing. Players still receive experience for accomplishing, but the reward actually matches the level of accomplishment. It eliminates the problem of wizards cranking out experience for casting easy spells. It also gives a little bit of encouragement for wizards to cast their harder spells. The only real drawback I see to this system is that it requires more paperwork and more math. Not a huge amount, in truth, but... time and time again, I have seen people say that one of the main reasons they find Frostgrave appealing, is that it is simple. This change would only increase the complexity by a small amount, but how many of these small changes can you make before a ‘simple’ system becomes ‘complex’? If Frostgrave were a role-playing game, I would most likely use this system. As a ‘simple’ warmgame, I remain unsure. Actually, this is really interesting from a game design point of view. Once again it encourages players to attempt to cast their harder spells; though I suspect, more than any other system, it encourages players to attempt the ‘best’ spell for a given situation, which should lead to the best ‘game’. Beyond that though, it brings an entirely new element of balance to the game. Players that are failing to cast spells are less likely to secure treasure. Thus, they will be falling behind in the wealth and experience point race. Under this system, the failing spellcaster would be compensated by receiving more experience from failed spells. In pure game mechanics terms, this system has a huge amount to offer. The problem is – it feels wrong to reward failure, and I suspect most players wouldn’t like it. I don’t know of any wargame or rpg that works this way. So, either this is a rather new and original idea – or it is just a bad idea that others have thought about and rejected.